It was the opening kickoff of the Rose Bowl. Redshirt freshman track star and Oregon quarterback Marcus Mariota‘s go-to receiver Devon Allen returned the kickoff. After a tackle, Allen instantly grabbed his knee and limped off the field. He never returned to the game. It was a sad moment for the USATF champion track star, his teammates, and Duck fans. Enter redshirt freshman wide receiver Darren Carrington II from San Diego, CA. The Scout.com four-star recruit had a career game against the Seminoles, grabbing seven receptions for 165 yards and two touchdowns. Carrington’s most memorable play came on a pass from Mariota, and after putting an ankle-breaking juke move on FSU safety Tyler Hunter, ran it 40 yards for a touchdown. But who is this Carrington kid? Oregon’s young receiver hails from Horizon Christian Academy and is the son of Darren Carrington Sr., an NFL defensive back who most notably played for the San Diego Chargers from 1991-95. Carrington II jukes FSU safety Tyler Hunter before running for a 40-yard touchdown. Perhaps Oregon fans will recall the leaping catch Carrington made against Colorado, falling to the ground but focused on the ball as it fell into his hands. 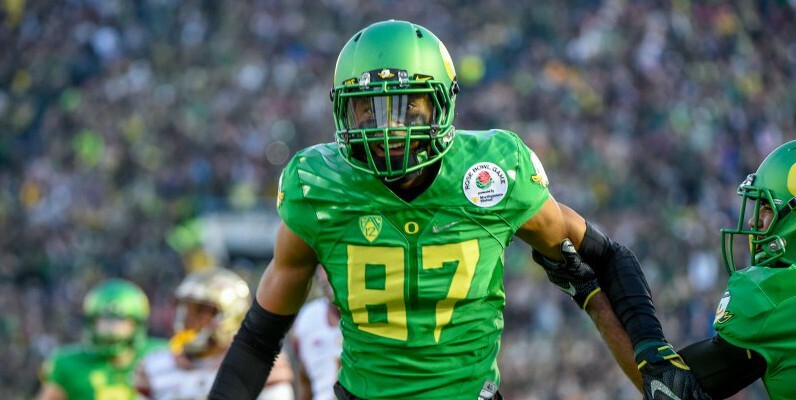 A fine introduction for Carrington and what was just the beginning for Oregon’s rising star receiver. The younger Carrington’s talents and football pedigree were on full display Thursday as the redshirt freshman stepped up to fill the loss of Allen. And it seemed Carrington was destined, and determined, to fill the void. “Like my dad always told me when I was younger: ‘Big time players show up in big time games.’ So that’s what I like to think, that I’m one of those big time players. Every time I’m on the field, I just want to make a play,” Carrington said after the game. And Carrington definitely delivered. Big time. 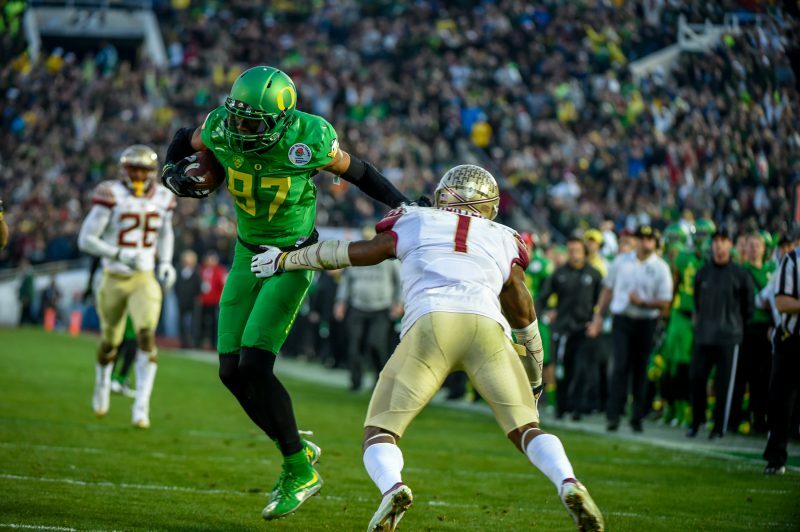 Oregon’s ”Next Man Up” philosophy allowed a very special young man to have a career game on college football’s biggest stage.